Twistlocks are used in the container corner fittings, which block themselves when turned to guarantee the stability of the container while moved. The “containerization” has been an essentials catalyst for the development of logistics and transport, because it has benefited new forms of working methods and distribution strategies. It has changed the form of the vessels, the structure of the harbours, the transport networks and the working procedures. The container permits a transport system “door to door” on a worldwide scale, increases the efficiency of the loading and unloading of the goods per time unit, reduces the trim costs, protects the loading from adverse meteorological conditions and decreases the theft of goods in the itinerary. The container has changed the form of the ships that transport them. Initially, the first generation of freight ships which carried containers, transported them below deck and their capacity was very limited, they were called SubPanamax vessels. Later on new generations of container-carriers were developed with a specific design to transport them, also above deck, for example the Panamax, which could carry between 3.000 and 4.000 TEUs. After that the Post-Panamax, the Super-PostPanamax and lately the so called Plus have emerged; which are immense vessels with a capacity that surpasses 8.000 TEUs. Recently in the People’s Republic of China (in Ningbo) the container-carrier CMA-CGM Marco Polo was launched which can transport 16.020 TEUs. However, I am convinced that it will not be long until the record of this mega-vessel will be broken. It’s curious how the vessels are classified with regard to the bottlenecks that exist in the worldwide maritime traffic network: Panamax for the vessels that can pass through the Panama Canal, which at the moment of writing this article has narrows of 12 meters of depth and a height of 57,9 meters although currently they are amplifying it. The vessels of the Suezmax type, are those that cross the Suez Canal, which has narrows of 20 meters of depth and a hight of 68 meters. 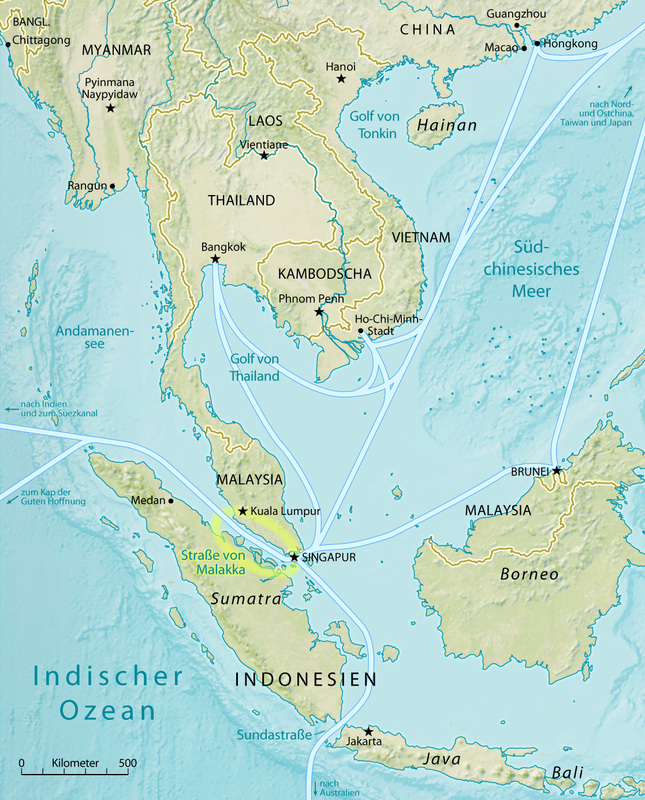 There are also the vessels of the Malaccamax type, which refer to the strait of Malaca, where there are problems with the narrows at Port Kelang and the Seawaymax, which can pass through the strait of Saint Lawrence, which communicates the Atlantic Ocean with the Superior lake. In the harbours the impact of the containers is impressive; but let us make a stock taking of the changes caused by them. The first change is with regard to the effort necessary for the loading/unloading and storage, which has been reduced considerably by mechanization and automation of the processes. The container due to its particular characteristics hides the freight, for which reason the control and the information flows which accompany these freight units have a great significance. 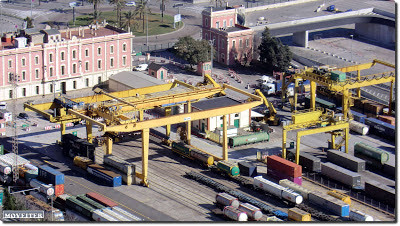 The gantry cranes as well as new forms of transportation vehicles appear and the terminals occupy extensive harbour surfaces to store and administer the containers with sophisticated computer programmes. The profile of the human labour is changing, which nowadays has a more technological than physical component. The infrastructures and the container carriers are a lot more sophisticated and expensive, for this reason, it is necessary to capitalize the period of the return of investment in a most efficient way during the lifecycle of the ships. And this can be achieved by reducing the costs for loading and unloading and the permanence of the ship in the harbour. The development of the international maritime commerce has provoked the apparition of big worldwide operators, which administer the goods with an integral logistics system, with a new vision of the harbour network as well as the emergence of Hubs or cosmopolitan harbours, where the big intercontinental routes (or deep sea) circulate, which together with the regional harbours account for the principal sea traffic. On a third level we find the short sea shipping for small and medium sized routes, which have a greater adaptability and a greater capillarity to be able to reach the terminal harbours. 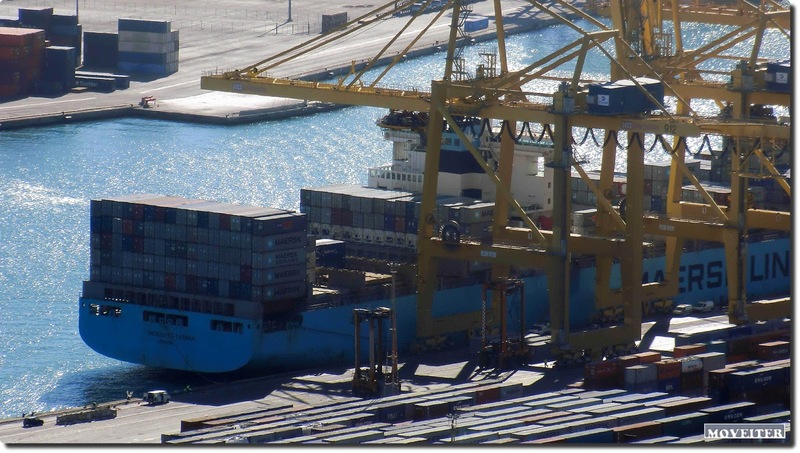 The maritime transport and the harbours have been the principal beneficiaries of the containerization and of the expansion of the international commerce. 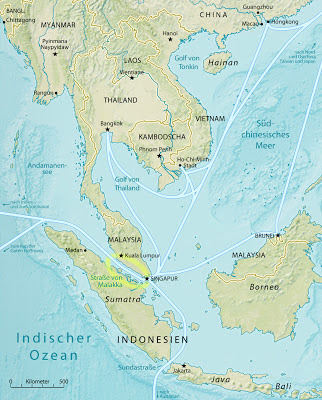 However, the expansion and the use of this type of carrier units has increased mainly in the Pacific region. For example, while in 1985 the principal harbours for containers were Rotterdam and New York, a quarter of a centenary later, the bulk of this kind of traffic has been shifted to South East Asia with central harbours like Singapore and Hong Kong. As additional data: in the year 2009 the hundred most important harbours with container traffic, handled 387,7 millions of TEUs, and 9 out of the first ten most important harbours have been Asian and six of them belong to the People's Republic of China. The Spanish harbours, as we can observe in the following graphic, play in another league. The containers undoubtedly have transformed the harbours with the development of logistic areas in their surroundings and the amplification of their distribution networks both in their hinterland and in their foreland. The inland container depots are railway installations at a distance from the principal harbours. In these inland container depots, the modal change of the containers is also carried out: from the train to the heavy traffic and the other way round, furthermore, it is those inland container depots, which amplify the influence of the maritime harbours that use them. A harbour is a contact point between two or more transport means in which the costs of the modal change can be exploited. 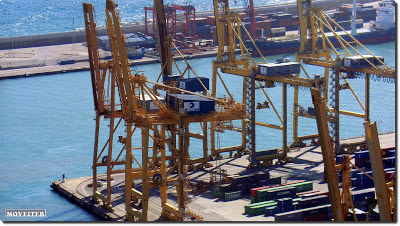 The goods of one container may have one recipient or not, and when a rupture of the freight is produced which obliges redistribution, this usually takes place in the logistic areas close to the harbour, where value is added to the products when the modal change is produced (for example: wrapping, labelling, quality control, assembly of the final product, fiscal control and customs controls, etc.). The modal change to the barge, the train or the road transport is the ultimate part of the itinerary to the client. The trucks normally transport a maximum of two TEUs and can reach a length of 12 meters, although in Australia or South Africa trucks can be seen, which transport 3 or 4 TEUs per towing vehicle. The trucks have a big advantage, as they are the transport means with the largest capillarity over the territory and can reach the door of any client. The train - with focus on Europe - usually transports in each convoy between 50 and 100 TEUs, reaching a length of 300 to 600 m. However, the North Americans, as another example, reach convoys of 400 TEUs with this are able to reach a higher benefit. Though, we must not forget the transport in barges in continental waters. A barge can transport up to 100 TEUs, and joining various barges, up to 470 TEUs can be transported in a convoy at an economical and very competitive cost, but still higher than that of the train. The global operators of the terminals dominate the container traffic. The major operators are: Hutchinson Port Holding, APM Terminals, Port of Singapore Authority, COSCO y Dubai Ports Word, which operate in any part of the world. Only the major ten global operators control more than 60 % of the worldwide container traffic. Please have a look at the following table to know who is who in the market of the container traffic. The association of shipping companies and global terminal operators has potentiated even more the power of these oligopolies. Globalization stimulates the search for bigger dimensions due to the economy of scales. Furthermore, an interest interface has been produced between shipping companies and terminal operators by obtaining a major control in the transport chain, cost reduction and control of a market which unfortunately gets less and less transparent for its consumers. While preparing this blog, I have got to know some interesting aspects about Malcom McLean, which I would like to share with you before terminating. 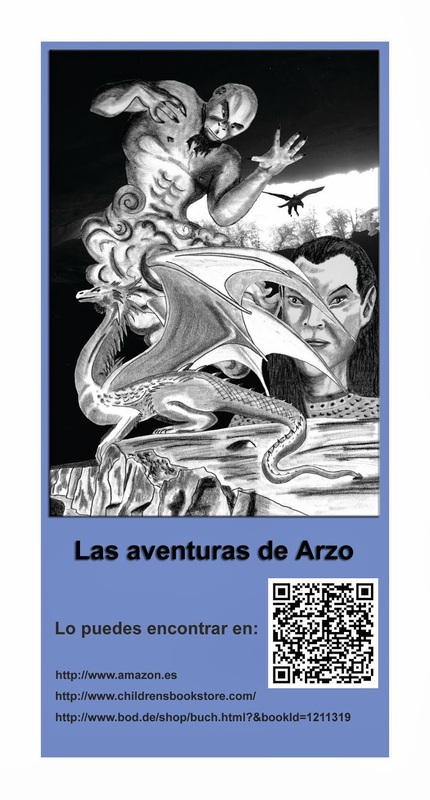 His history is the typical tale of the “self-made” entrepreneur and business man and of the “American Dream”. From his humble beginnings as employee in a filling station, he bought a truck and was able to create one of the first truck companies in the United States of America. However, when he had the idea of the container, he did not doubt to sell his company and buy a shipping company to make his proposition come true. What most surprised me was that he had already reached something in his life, he had success, but he needed to risk everything for his new project and did not doubt to reinvent himself to achieve it. He was a visionary, one of these few people whose ideas have marked our evolution and development. Your post has been excellent and nice. Your topic is useful for all. I come back in your site when you will provide new post.